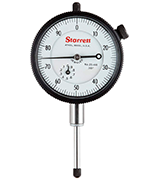 Starrett 25-441J Dial Indicator, 0-1"
The hardened steel gear train and jewel bearings provide reliable protection against vibrations and accidental drops of the device. 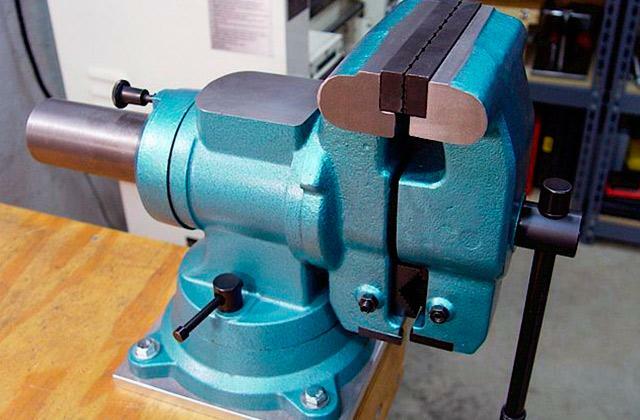 On top of that, it gives the tool great precision no matter the circumstances. The kit doesn't include a carry bag. The Starrett 25-441J is designed for professional use and will be a great helper in measuring small pieces and calibrating the automated equipment where every thousandth of an inch matters. 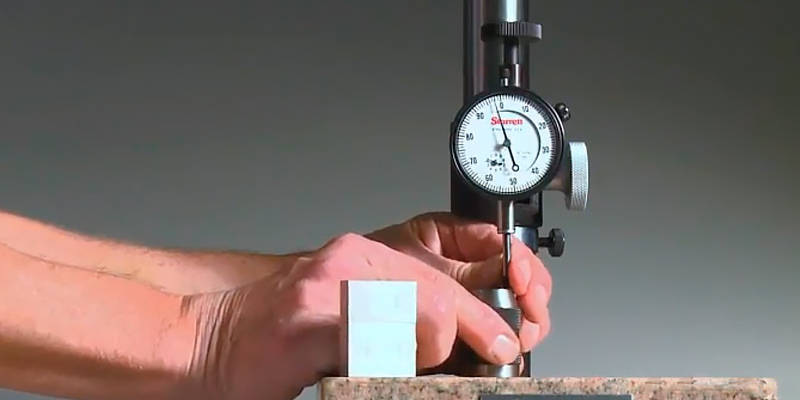 The precision of up to 0.001" will ensure that all the measurements will be correct. 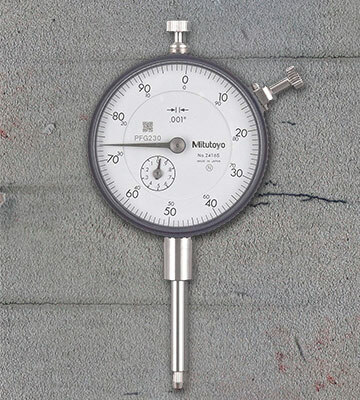 Mitutoyo 2416S Dial Indicator, 0-1"
A fully sealed face of the tester makes the tool water- and dust-resistant, which is an important feature for measuring the tools that tend to get dirty when used. Quite heavy (requires a strong mag base). Japanese testers from Mitutoyo are known for their intricate designs and this model is no exception. The big 2-1/4" dial face of the indicator is painted specifically to reduce the deflection of the light, which makes it easy to read regardless of the viewing angle. 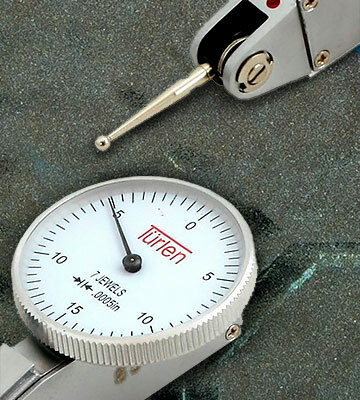 Türlen AT203721 Precision Test Dial Indicator, 0-0.03"
Thanks to its compact size, the tool can be mounted on special mini-mill and mini-lathe tools. The point, on the other hand, is highly sensitive, which allows reducing the deviation to minimal levels. The bezel is prone to scratches. If you are looking for a budget-friendly yet precise test indicator, then the Türlen AT203721 is the right model for you. 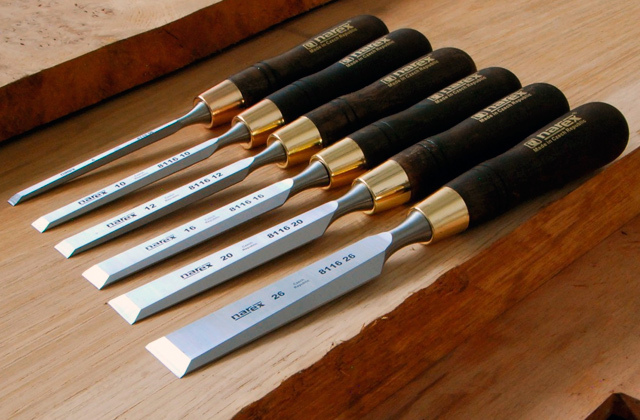 The deviation of only 0.0005" makes it an excellent tool for delicate projects that require an extra level of accuracy. 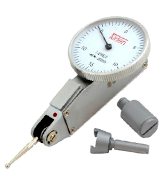 Gold Plus AGPTI16 Dial Test Indicator, 0-0.06"
The three additional measuring points extend the measuring range significantly while providing the precision and versatility to the device, thus allowing you to test different materials. The points replacement process is quite tiresome. Unlike other similar models, this one is equipped with two dials that allow measuring various lengths without any additional settings. On top of that, the 210° swivel arc makes tuning of the measuring point a real breeze. All Industrial Tool Supply TR72020 Dial Indicator, 0-1"
The tester comes supplied with a special 9" magnet base that can be adjusted to set up the indicator exactly how you want. 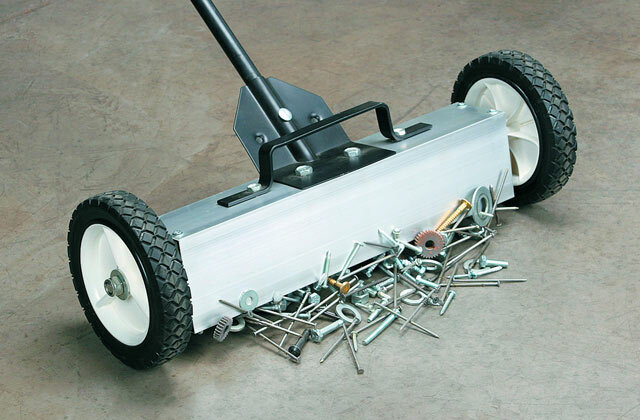 What is more, the magnetic force of 5 lbs makes it easy to mount the base. If not transported with care, the indicator points may fall off. 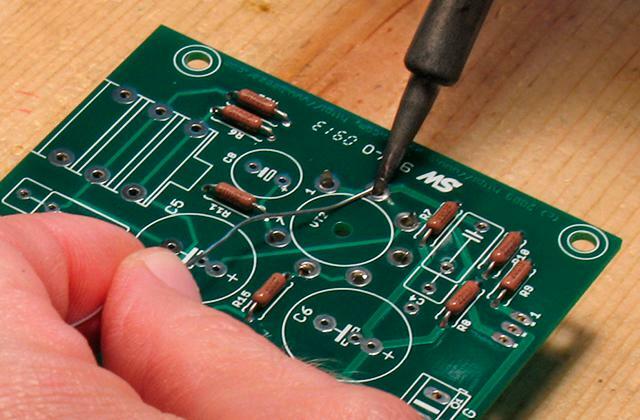 On top of the magnetic base and the tool itself, the kit also comes equipped with a set of extra 22 point indicators. Versatile and highly precise - this instrument will be your go-to pick if you need a universal model that can manage the measurements of all kinds. 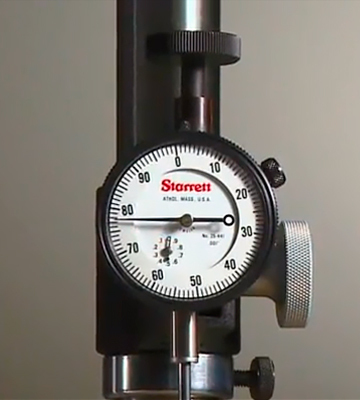 The Starrett 25-441J is designed specifically for dial reading and the device does this job quite well. While a durable measuring tool can be hard to find, fortunately, the Starrett is a brand that is known for its high-quality products. The scaling of the dial on the outer face goes from 0 to 100, while the single scale will help you in counting the revolutions. 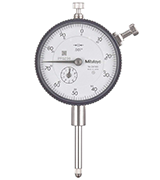 The measuring range of the main indicator face is 0.375” with a 0.001” graduation. The deviation is minimal as it should be, considering that this model is not a cheap one. Additionally, unlike some budget models, the face of this indicator is painted with non-yellowing paint. It will ensure a longer service life of the device and result in a larger number of successful measurements. The only real flaw of the packaging is the lack of a carry case for the tool. Since it is quite fragile if transported without one, this is a bit of a bummer, to say the least. On the other hand, however, the tester is quite precise. 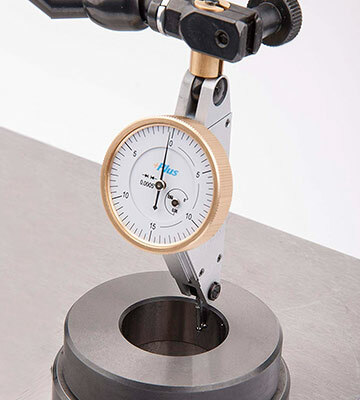 This particular indicator model can be used for measuring the automotive parts of the workbenches for precise calibration, as well as for general length and deflection testing. If you need an additional indicator for more complex or precise measurements, there are 24 other models optionally available that will provide you with different measuring lengths. To wrap things up, the Starrett has, once again, delivered a great product that can be used on par with professional models without sacrificing the measurement precision. Perfect fit for any machinist, the Mitutoyo 2416S is a standard indicator that will do its job without breaking much of a sweat. More so, it will do its job precisely with very little deviation. The double-labelled face of the tool makes reverse reading possible, which will be helpful in situations where you need to test multiple directions in one go. 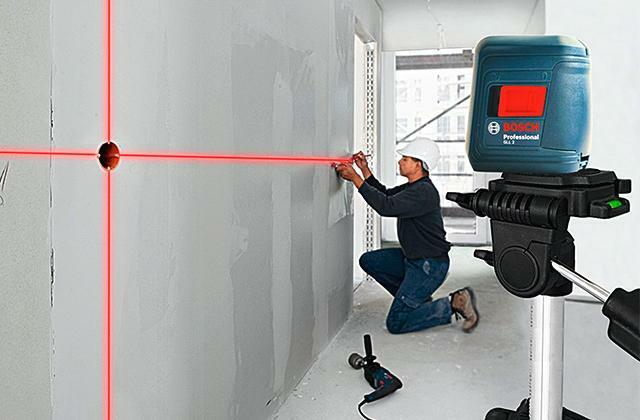 The sealed design of the measuring tool firmly protects the face and the dials themselves from dirt, dust, and liquids. This is crucial for various areas where dirt and dust are inevitable such as machining tables and production lines. The stainless steel body is quite durable and is easily washable, besides being resistant to corrosion. This particular dial model is designed for measurements between 0-1” with a deviation of ± 0.002”, which is fairly accurate for such a compact indicator. The outside diameter of the stem is 0.375” and that will be more than enough for most basic tasks. Further down the list, the 2.24” diameter and 8.8 oz weight of the device will make it a great portable option for various measurements. 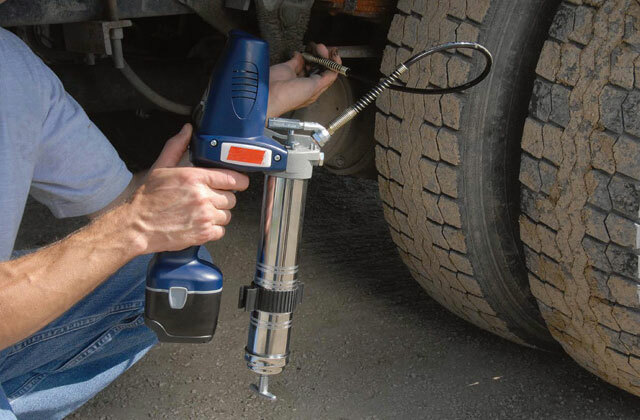 To make the transportation convenient, the tool comes together with a storage case that will prevent any potential damages and keep the unit in perfect shape no matter the circumstances. The precision measurer from Türlen comes equipped with a set of additional parts that will help you achieve the most accurate results. In addition to the interchangeable parts, the kit comes equipped with a special carry case that will make transportation a breeze. 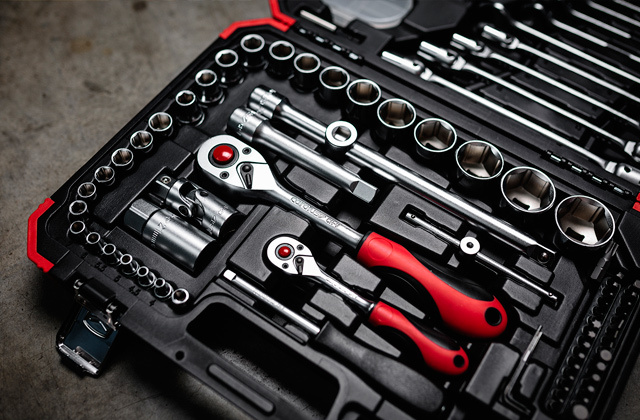 While one side of the case will fit every piece of the package, the other features a special padded compartment that will hold the tool firmly in place, which is important during transportation. On top of that, the indicator also comes with a wrench that can be used to unscrew the probes. The only real issue with this tester is its easily soiled dovetail. However, if you clean your testing kit regularly, you won’t run into any major problems. On the bright side, the dial indicator is capable of measuring everything in range of 0 - 0.03” where a single line graduates by 0.0005”. Despite its modest price, the deviation is insignificant and the range of the latter doesn't go higher or drop lower than 0.00035”. 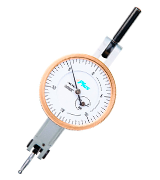 What is more, you can increase the measuring range using the side dial by adding 0.015” per revolution. In the end, this budget-friendly model from Türlen will be a real treat for any specialist that needs a high-precision device without breaking the bank. 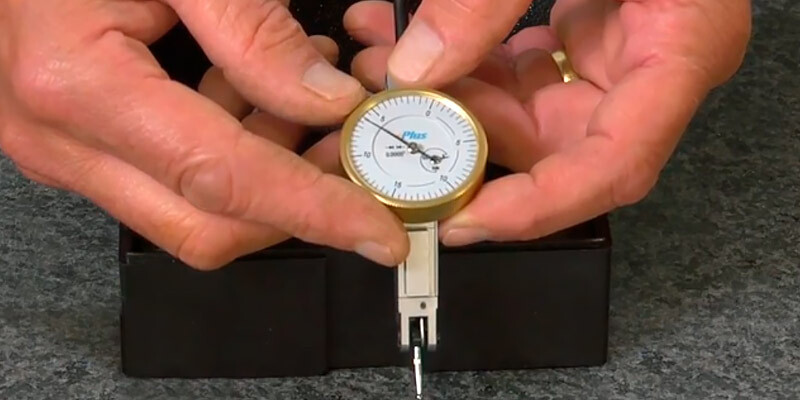 The Gold Plus AGPTI16 is a test indicator designed for ranges of 0 - 0.06”, however, there are a couple of additional parts that help extend the measuring limitations. The copper alloy housing will make sure that no integral parts will be damaged or affected by premature corrosion. Even though this particular model is not the sturdiest one, considering its relatively low price, we can forgive a slight shortcoming in this department. After all, all you need is precise measurements, not pretty looks. 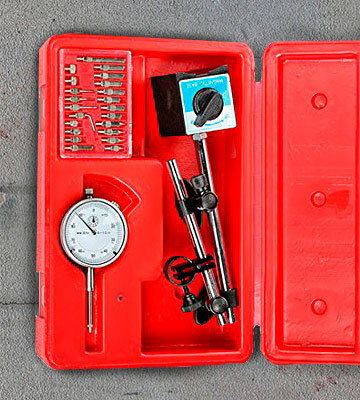 The kit includes a 1-1/2 “ test indicator, 2 dovetail clamps that provide a long clamping range, and a couple of extra contact points for a wider measuring range. What is more, it also features a ⅜” busing and a fitted case. The latter has one minor flaw though - when you put additional contact points into their respective clamps, they might fall out if not transported with care. Other than that, the container is quite sturdy and will surely protect the main piece of equipment - the dial indicator itself. Of course, the meat and potatoes of the kit is the dial tester, so let’s take a closer look at its specifications. The measuring range of the device with a standard point equipped is 0.060”, while the additional 2 carbide points and 1 steel point will allow you to measure in ranges of 0.080”, 0.120”, and 0.040”, respectively. All in all, the Gold Plus is certainly one of the best dial indicator models for its price, thanks to its versatility and precision of measurements. 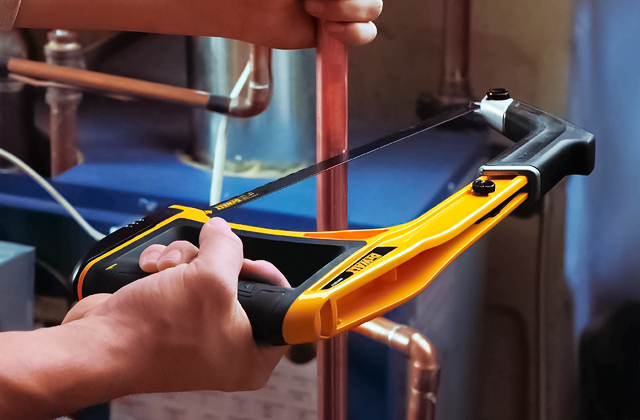 The All Industrial Tool Supply TR72020 has all it takes to be a great measuring device. 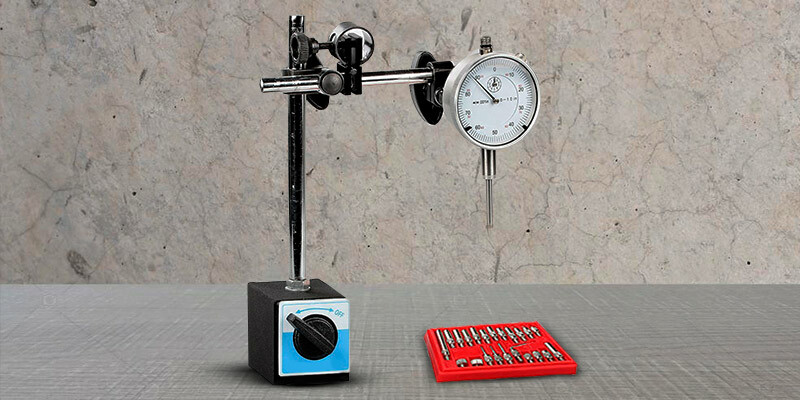 First of all, its dial tester features a magnetic base that can hold the tool in place for extra precise measurements (both horizontal and vertical). Contrary to other similar models in the same price range, the TR72020 indicator comes together with 22 different measurement tips that increase an already good measuring range of the tool. The carry case is fairly basic and made of plastic, however, unlike others, it actually holds every piece in place firmly and won’t let them fall out. Moving on to the indicator itself, it is well-built and doesn’t require any extra calibration. Just set the needed range (depends on the tip you are using) and you will be all set for the measurements. 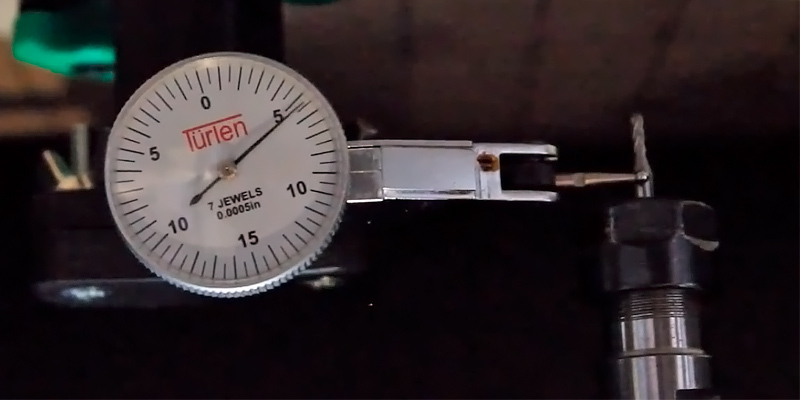 The graduation of the main face of the indicator is 0.001”, which should be accurate enough for most basic jobs, including calibrating the workbenches and their smaller, automotive parts. Despite the fact that some of the set's parts are a little flimsy, the dial test indicator itself won’t let you down in time of need. 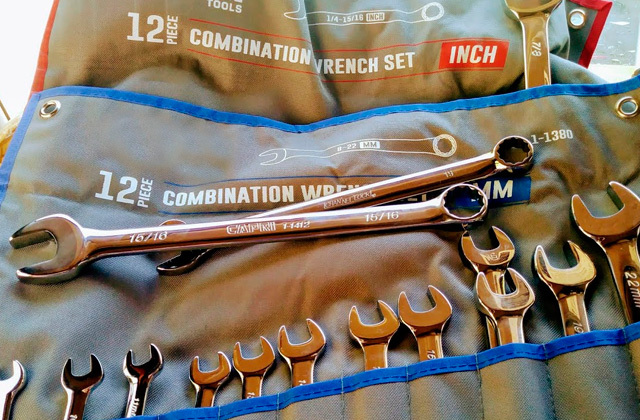 Precision to match and high versatility definitely make this model hard not to get, especially if you don’t already have an indicator of this kind in your toolbox. What Is a Dial Indicator? The dial indicators are widely used in various areas, from simple machining to precise engineering. Their sole purpose is to detect any inaccuracies that a naked eye simply cannot see. 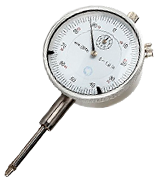 A regular indicator consists of several parts but the core design includes two faces with dials, clock-like hands, and a spindle that is used for measurements. 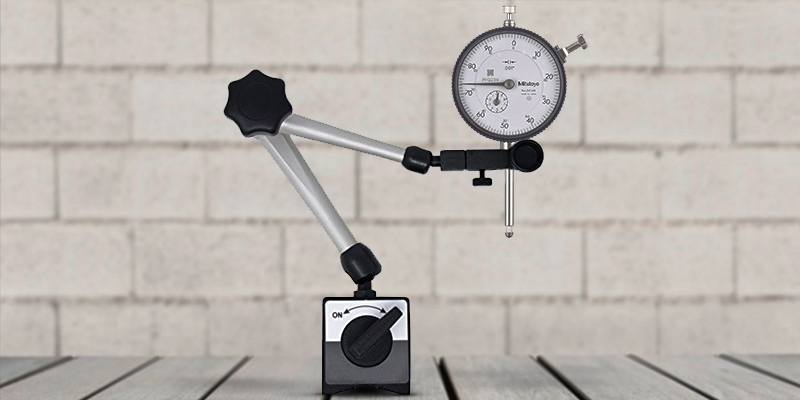 Contrary to regular indicators, the dial models have a smaller measuring range and are utilized to detect the deflection of the arms, angles, and general length. What is more, they can be used in both metric and imperial measuring systems, given the right settings. While the bigger face is used for measurements, the smaller one is usually dedicated to keeping track of the number of revolutions. 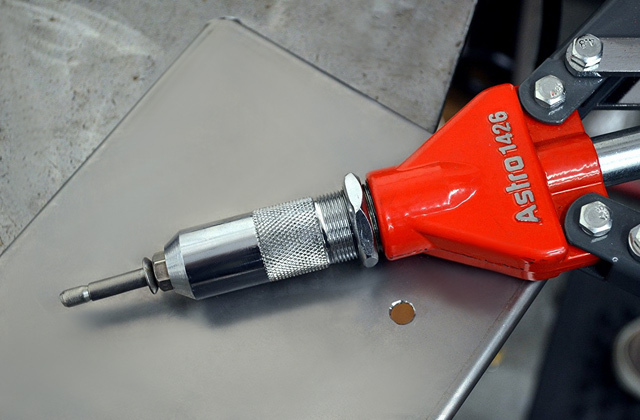 Although the manufacturers supply their indicators with a range of measurements for every specific model, it is important to measure the length of the pointer tester (spindle) and measuring range. This will help you figure out the particular model that meets your needs. 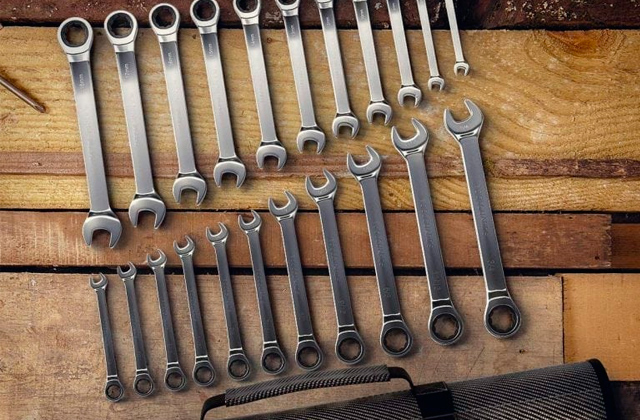 To keep all your tools in order, we also recommend taking a look at our tool boxes review. Additionally, you can keep all of your devices within a hand’s reach by storing them in a magnetic tool holder.